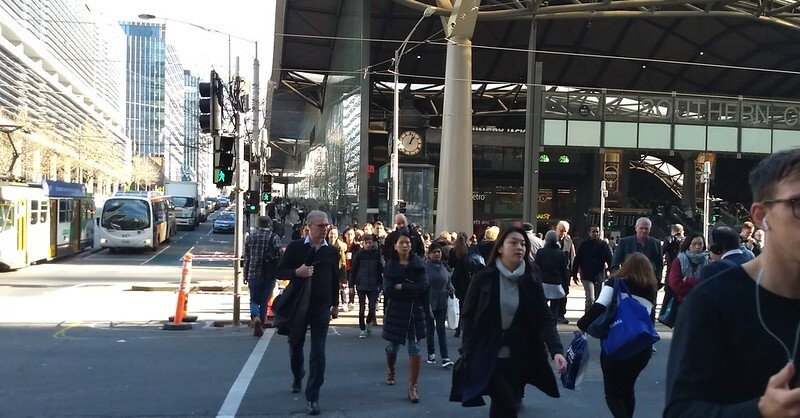 It’s not uncommon to see trams stopped at traffic lights along Bourke Street, sometimes in queues, at locations where there is no stop. If you’ve wondered why your tram journey is start-stop, it won’t surprise you to learn that the lights are all over the place. With the handy-dandy stopwatch function on my mobile phone, I timed the lights along the central and western section of Bourke Street. No wonder trams have to stop continually at lights! Shorter cycles — There are obviously competing demands on the various streets. Because of large numbers of pedestrians, you can’t necessarily have pre-emptive traffic lights that detect trams coming and switch instantly to give them the green. But you could certainly reduce the cycle times. Judging from existing timings, even with our wide streets, it could be as little as 30 seconds each way, or a cycle every 60 seconds. This would greatly cut down waiting times for trams and walkers and everybody else for that matter — but you’d need to check the 15ish seconds Green Man time is enough to get waiting pedestrians off the kerb. 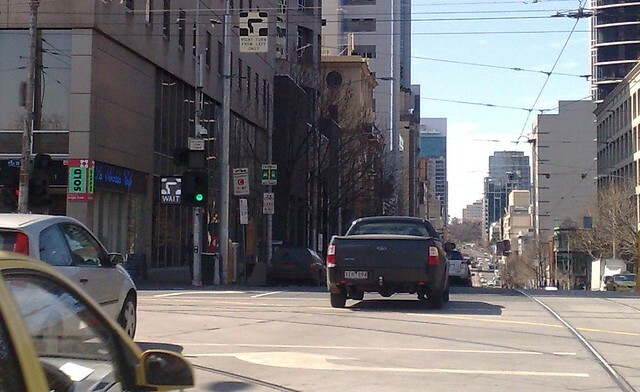 The King Street intersection is particularly bad, giving most of its time to cars — despite Vicroads data showing traffic on all segments of King Street between Flinders and Latrobe Street dropping between 2001 and 2011, and despite that policy should not be to prioritise cars in and through the CBD. But William Street is almost as bad, despite having much fewer trams than Bourke Street (typically 5 per hour on route 55 vs about 15 per hour on routes 86 and 96 combined). To help tram drivers know when to depart, for the spots where traffic lights are distant from the tram stops, they should get these lights working — they’re meant to indicate when the best time is to take off. It doesn’t necessarily result in a quicker trip for the tram, but it may allow the driver to wait for passengers who might otherwise miss the tram, while knowing the tram isn’t about to miss a green light. 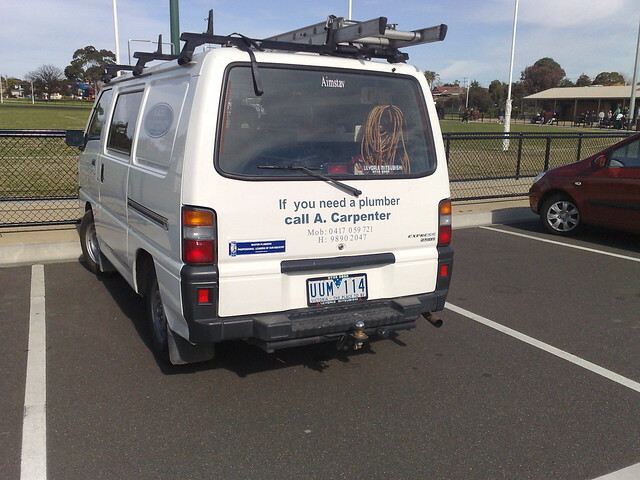 That’s the theory, but they never seem to actually operate. 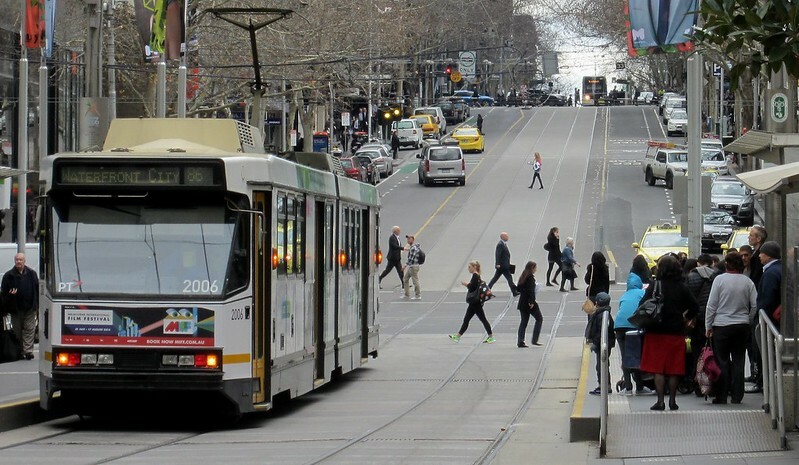 Co-ordinated cycles — For where there are multiple intersections which are between tram stops, whether or not they are short cycles or long, they should at least be co-ordinated. In this section the important ones are the intersections at Elizabeth and Queen Streets, as well as the pedestrian light in the middle. A tram leaving the Elizabeth Street stop westbound, and not delayed by anything else, should never get a red light before the next stop — and vice versa. 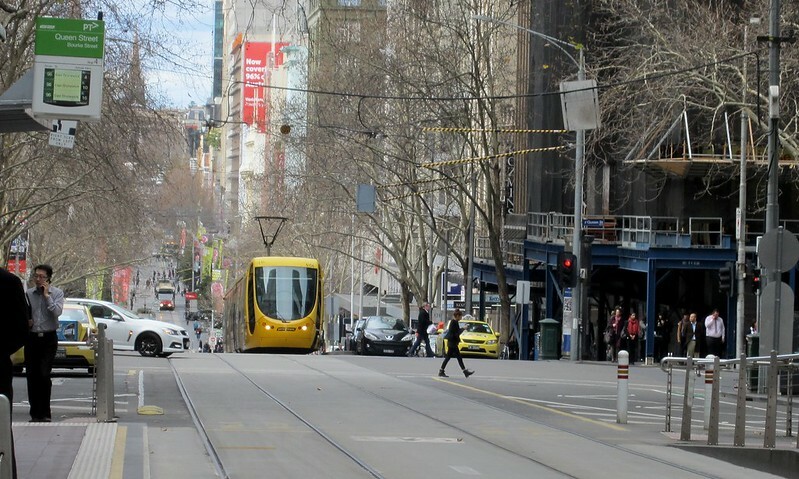 Obviously you’d need to work out the best cycles for the intersecting streets as well — for trams on Elizabeth Street and buses on Queen Street. But how hard could it be? 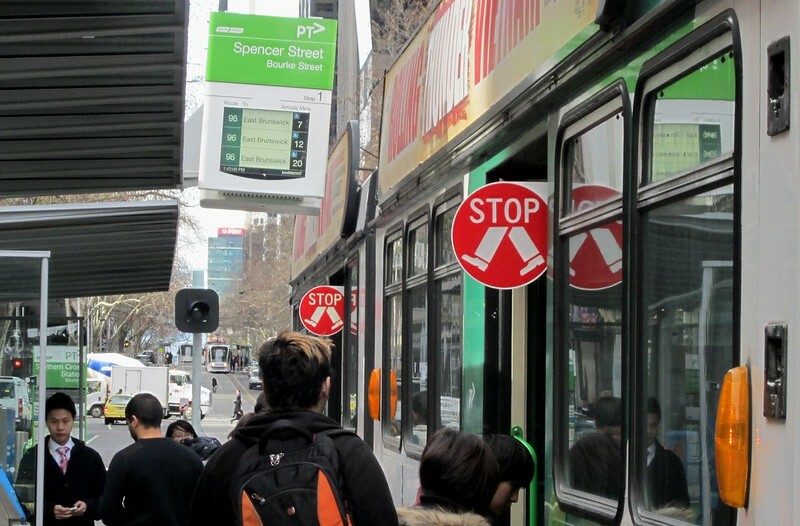 With the recent movement of tram stops, there are now similar blocks of traffic lights between stops along Swanston Street and Elizabeth Street. Traffic light programming isn’t the only cause of tram delays of course. But if moving people quickly and efficiently around the CBD is a priority — and it should be — these issues need to be addressed. I know it’s been around for a while, but I was quite struck the other day by these traffic lights on the corner of La Trobe and Swanston Streets, facing southbound traffic coming down Swanston. The left and right arrows are for motor vehicles (which can go left or right, but not straight ahead). The middle two are for cyclists (which have their own “Copenhagen”-style lanes) and trams. 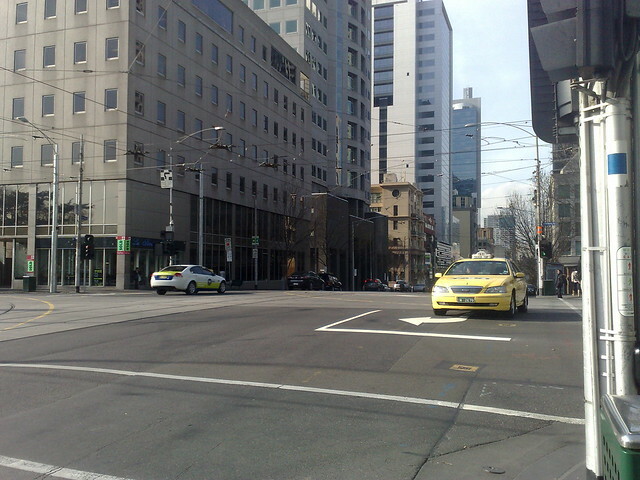 They go when all vehicles are stopped (which is also when pedestrians cross La Trobe Street north-to-south). I wonder if these are a little bewildering to novice drivers, having all the lights in a bunch like this? Finding and obeying the individual light(s) that apply to you would be a good challenge for learner drivers (and you’d hope the rest of us can get it). 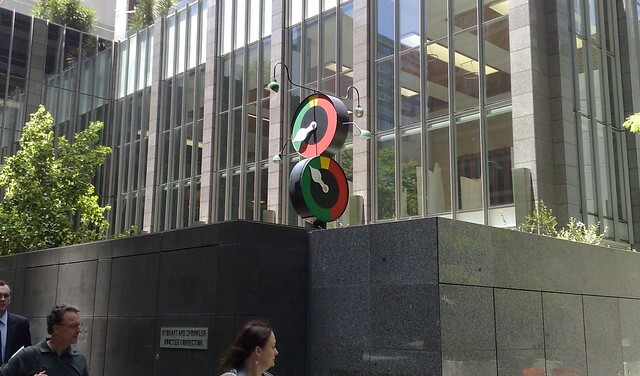 Any good examples of other complex sets of lights, including in other cities? 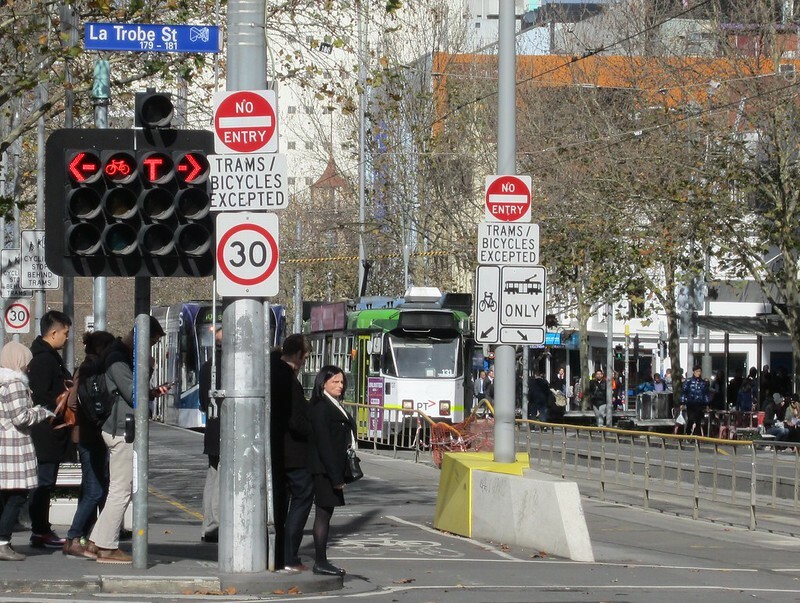 See also: Road morons invade the Bourke Street Mall / How many No Entry Signs does Swanston Street need? I’m not sure what these things are called. They’re from the days before traffic lights — before my time. The only problem with these ones is that two directions are getting a green signal at once, which would result in a crash. This street sign looks a little different. Ah, you see the footnote on it? “Private lane”. Presumably this is because it leads only to the RACV’s carpark, and is on RACV property. But it may have legal implications as well — at a conventional street corner, traffic coming into the side street needs to give way to pedestrians crossing it, but coming out doesn’t. I reckon if it’s a private lane, then like at a car park entrance, traffic needs to give way in both directions. PS. There are also animated/flashing signs signalling for right-turning drivers to wait. Will see if I can snap a pic of one. PS. Thursday morning. Here’s a pic showing one of the new flashing “Wait” signs. 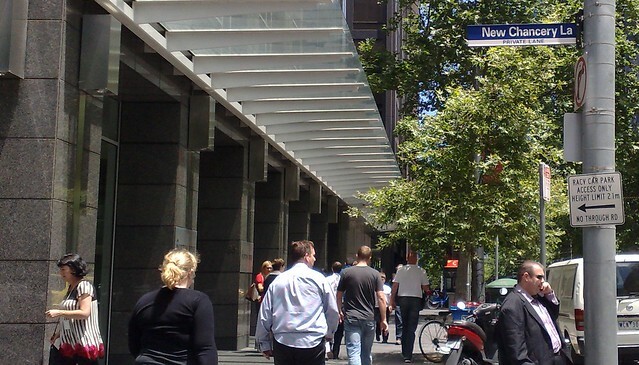 Similar signs have been installed at the Elizabeth St/Latrobe St corner.